Today, we see a lot more people turning to the internet to make their living and earn their livelihoods than we ever have. And why not, since there are some fantastic ways of making money online, especially if you have a blog. Blogs are pretty easy to monetize – provided you know some of the ways to go about it. I will list down some of them in this article. Disclaimer: This is not one of those ‘make money online and get rich overnight’ articles. Most of those get-rich schemes are nothing but scams and false advertising. The truth is that there’s no such thing as ‘get rich overnight’. Making money online – well, at the very least a decent amount of money – takes time, and you may bear the fruits of your efforts a year or two down the road if you start right now. Secondly, earning online isn’t easy, it’s anything but in fact. It takes a fair amount of hard work, patience, and perseverance. However with the right knowledge, application, the right set of tools, and the right attitude, there’s no reason why you can make money through the internet, and maybe even establish your very own e-commerce business down the road. PPC is short for pay-per-click. One of the biggest examples of PPC is Google AdSense. What AdSense, or in fact any PPC-based ad network does is that it places ads (targeted advertisements, related to your blog’s content) on your website. You, the blog owner, determine where the ads go. You earn a small amount of money whenever a visitor clicks on an ad on your website (hence pay-per-click). It is one of the most commonly-used ways of making money online. However in order to be effective with PPC-ads, you need to be able to drive a large amount of targeted traffic on your blog, as that gives you a greater chance of getting more clicks and hence more money. While Google AdSense is the undisputed king of PPC ads, some good alternatives worth looking into include Chitika, Adbrite, Kontera and Clicksor. Example of a Google AdSense Banner ad on a sports blog. Notice that the ad has been targeted towards the audience of the blog. CPM stands for cost-per-mille, where the word ‘mille’ stands for thousand. As compared to PPC-ads, CPM-based ad networks pay by impressions – typically thousand impressions. This means that you put ads on your blog, and you’re paid according to the number of times people see the ad. This can be a great way for blogs with a consistently high amount of traffic to monetize their blogging efforts, but could also work with blogs with lesser traffic. The great thing about CPM ads is that they can be used along with PPC ads. Popular CPM ad networks include Tribal Fusion and Adbrite. For me, affiliate marketing is simply an outstanding way to earn money online. It is safe, fool-proof, and can be quite lucrative if done the right way. Basically affiliate marketing involves two parties – a merchant and an affiliate, with the latter (the affiliate) responsible for marketing the products and/or the services of the former (the merchant), with the purpose of driving sales. The affiliate earns money – usually a percentage of the sale – each time a successful sale is made through his/her marketing efforts. The best affiliate marketing program out there is the Amazon Affiliate Program. Basically, you put ads to Amazon products – either in the form of links or various banner-based ads – on your blog, and each time someone buys something from Amazon through your link, you earn a percentage of that sale. Now if you remember, I said affiliate marketing can be quite lucrative; if someone buys a product worth $4000 and your affiliate program gives you 5% of the sale, you make $200 just from one sale! The great thing about affiliate marketing is that it requires very little efforts, and the merchant is only responsible for making the sale. 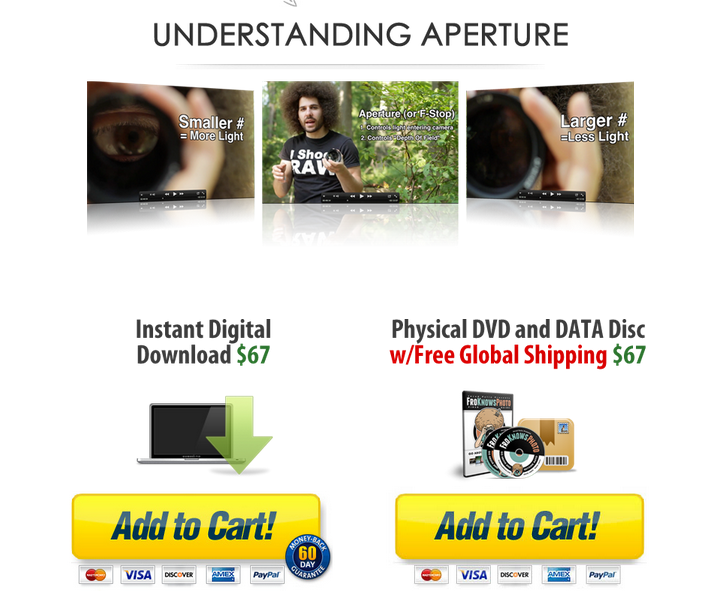 Affiliate links – including one of Amazon – on a photography blog. Many different affiliate ads on the sidebar of a blog. Your blog is perhaps the single best resource for you to sell something that you develop or make, and earn money through sales. Look at what it is that you can offer to people, and realistically sell through your blog – it could be an eBook on getting more traffic, a WordPress or a Google Chrome plugin, a Windows application, an iPhone or an Android application, a video-series on learning to play the guitar (such as GuitarTricks, for instance), a web-designing service, a WordPress theme, and so on and so forth. Think of things – small or big – that you can sell to the people that your blog caters to. 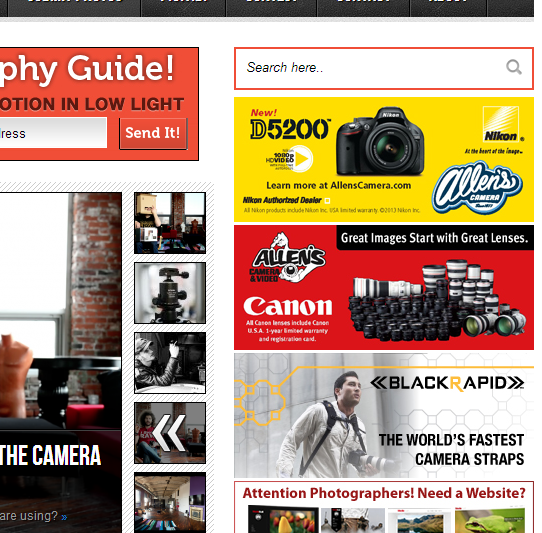 A photography blog selling an online photography course for newbies. Selling a WordPress Theme online. Charging for memberships could also work provided you give your members something really valuable in return, and something that they would be willing to pay money for. Make a special members-only section on your website, and provide membership to people who pay for it. This works best for websites offering tutorials (like Guitar tutorials, for instance), classes or lessons. You may also consider opening certain content or part of your website for everyone, while giving special, extra or added perks to certain members only… for a price of course. Both these methods could work quite well for different kinds of websites. Freelancer.com offers a free basic membership, but provides a ton of goodies for money. 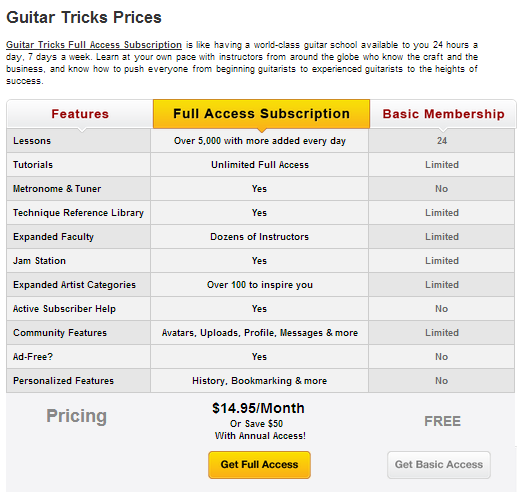 Guitar Tricks offers a few lessons for free, but gives access to over 5000 lessons if you buy their monthly membership. In addition to, or as an alternative to selling physical/tangible products online, you could consider offering some sort of a service as well. A blog – be it a company blog or a personal one, can be great for building an online portfolio as well as building authority and a name for yourself. If you’re good at something, might as well make money off it, and what better way to do so than offering it as a service online. SEO, web-designing, content writing, freelance photography, graphic designing, consultation… there are tons of things that you do here. Build a good portfolio on your blog as blogs are the best way to market yourself and build authority. Once you get the word out, it could very well turn into a fun way of earning your dough! 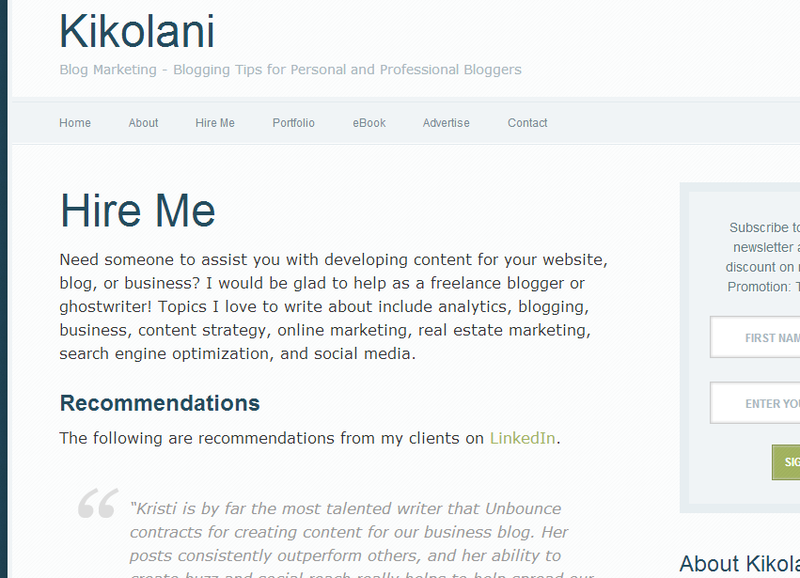 Kristi Hines of Kikolani offering content development services on her blog. 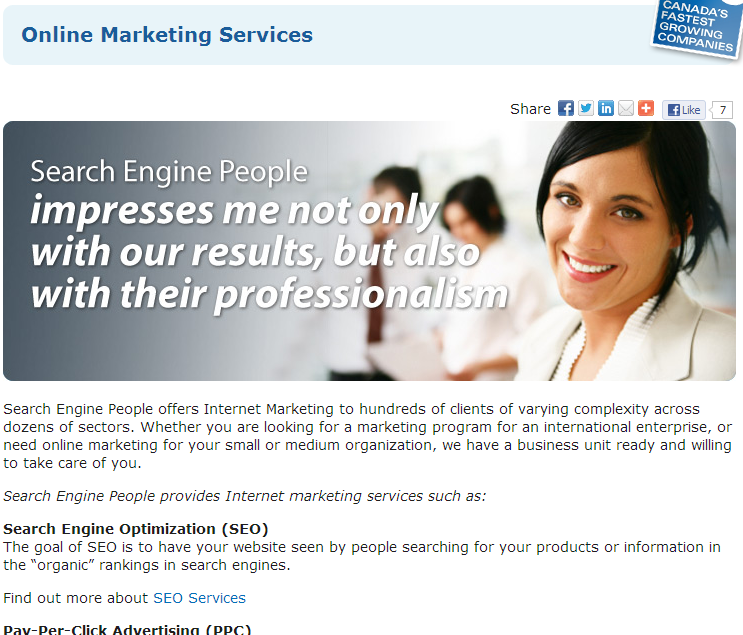 SEP using their blog to offer online marketing services. Consider asking for donations on your blog. Many blogs have the Donate button usually placed in the sidebar. Other blogs and websites run donation drives certain times every year; Wikipedia does this every year. The fact is that asking for donations can be an effective way to earn some money – provided you do it right. If for instance you’re providing a product or a service for free, you could ask visitors and readers on your blog to consider donations a small amount of money to you. This can especially work if what you’re offering is useful and valuable to the people in your niche. Don’t expect to earn a lot of money though, and above all, don’t force people to donate. Put a simple unobtrusive PayPal donate button on your blog. The Donate button on Ken Rockwell’s photography blog. Justin’s guitar blog, with a simple appeal asking people to donate whatever they can, so he can keep his lessons free. I’d love to hear from you about this: what are some great ways to earn through blogs and websites on the internet? Leave us a comment in the comments section below!